This cruel trade needs highlighting. "He'll come to you, if you remain stationary." Just how sharp is the Sharpie? 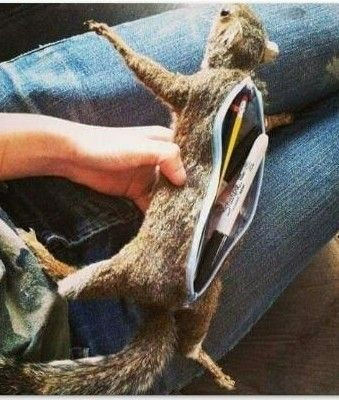 The beaver pencil case never quite caught on. This is what happens if you hide my f*cking acorns. "My mum keeps my life very educationally centered. For instance; here is a picture of my school supplies (in costume), last Halloween." He's extremely territorial - leaves his mark everywhere. Scrat is looking a bit pens-ive today. "Funny, when he used to run around in our garden, we called him Zippy." My emotional support pet is nothing to write home about. Cruelty .... It's an open and shut case! "Unfortunately, that was the last ever episode of 'Tales from the Riverbank'." Wise students always squirrel something away for a rainy day. He went into Staples and got fleeced! Unfortunately, my Amazon order for a term-time rodent pencil case wasn't a typo. Also available in pigeon hat, rat gloves and ferret colostomy bag. After delivering McVitie's for three years, our supplying-squirrel was put to one final use.